Who's head is bigger? EarthDoctorSon or Ginsberg? The pup is almost 1 year old. Shortly after the new year begins, Ginsberg will be a yearling. As if to take advantage of his last days of puppyhood, he has been so so sweet of late, plopping himself down next to me on the couch, and resting his big ole head on my lap. He still greets me at the front door with his paw on the handle (in hopes he can open the door), his ears pulled close to his head, his head thrown back, jaws wide open as if he is shouting with joy. It's so silly, I can't help but laugh, and it's very hard to correct his bad habit of jumping up on me and trying to lead me around with his mouth engulfing my hand. But I digress. The 44th Street Accidental MicroKennel is coming along quite nicely, thanks to some extraordinary professional help. I've officially designated my friend, Naomi, "Ace Handler" for the 4th Street Accidental Micro Kennel. She's been helping me train Ginsberg since he arrived. And it's no big deal to her. She's a horse wrangler, too, so large mammals don't intimidate her a bit. She also adores cats, but I can live with that. Recently she remarked that Ginsberg's head is the size that he was when I brought him home as a 7-week-old puppy. Who knew? That's my Ace Handler romping with Ginsberg, Cora, and me right after our first big snowfall last month. I have completely healed from my second knee surgery. I'm astounded by the experience of being pain free. Pain is so insidious, isn't it? I realize now that I've had pain for years, and that it most certainly took a toll on my spirit and energy. I am incredibly grateful to TopFlight Knee Surgeon, who is a team physician for multiple professional teams in the Twin Cities, and is just as kind as they come. He willingly posed for a picture of me. Someday I'll have to sign a piece of mushing paraphernalia for him to hang in his offices, along with the authographed jerseys of big-time basketball, football, and hockey teams. Did I mention I'm the best musher he treats (and the only one he treats)? And how cool is this? 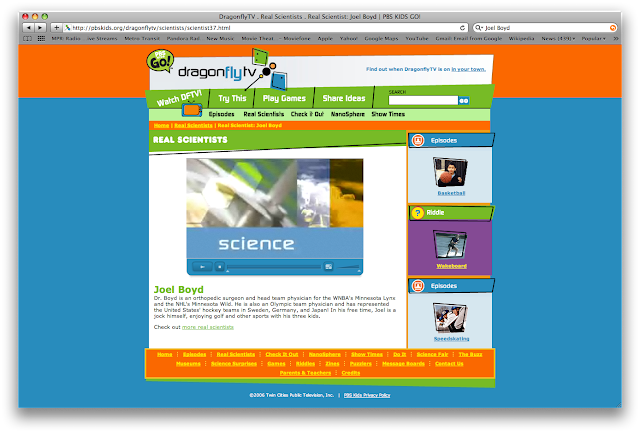 I recently discovered that PBS DragonFlyTV featured him in a fun video for kids about Real Scientists. I couldn't find a way to embed it, but I hope you'll have a look! It'll give you a sense of what a great guy he is. 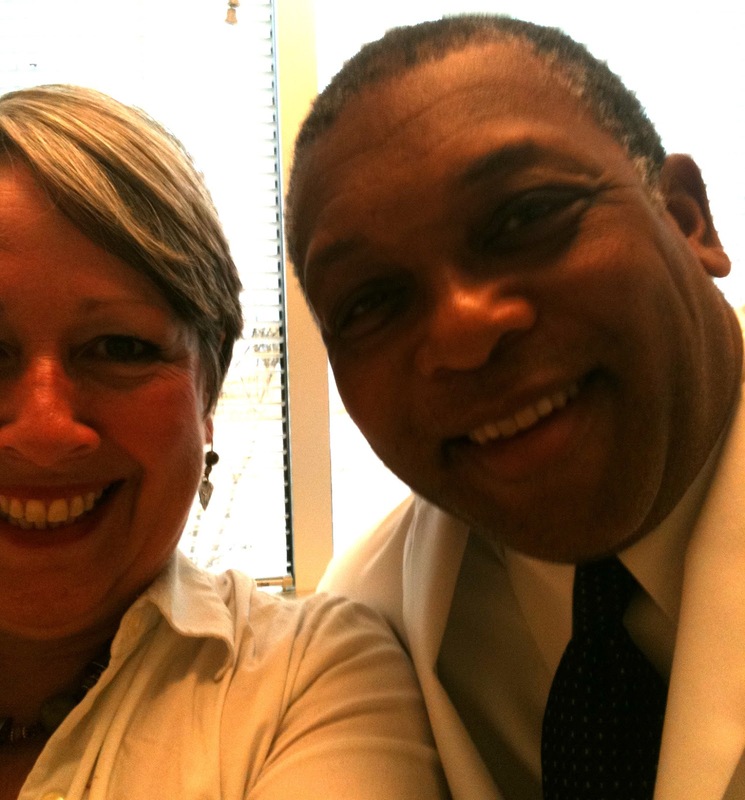 One of the best things I ever did for my health was visit this mother tiger of a doctor for the first time (oh my goodness can it possibly be?) about 17 years ago. She was recommended to me by another very fine physician with whom I was working at publishing house. She is Brilliant. BRILLIANT, I tell you. I have worked with hundreds of doctors over the years and I have never ever known a more astute diagnostician. (Watch out Gregory House! She's way better than you, a whole lot nicer, and usually right the first time around!) What's more, she makes me laugh so hard, I feel better just for having spent a minute or two in her company. Which is kind of silly to say, because we rarely get through a visit in a minute or two. Why? Because we're laughing so much. I was so spent after the Year of the Sledgehammer, she highly encouraged me to take a little time off and I did and I'm much better for having done so. She is the first and only doctor who has kept better track of stressors in my life than I do. Oh, and did I mention how much we laugh when I see her. Check out the awesome book she made sure the Team had. I am also the best musher in her practice (and the only one in her practice). I've been sugar-sober since July. 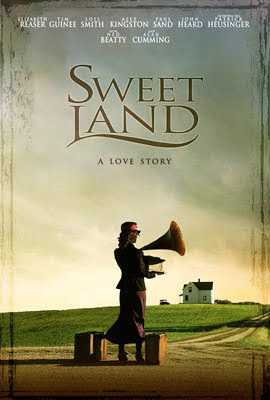 I just woke up one day and realized that refined sugar made me a little crazy. No, a LOT crazy. As in addict-kind-of-crazy. So I decided to withdraw from it cold turkey. Can't say it was easy, and sucrose/fructose/whatever-ose seems to be in EVERYTHING! But it's been well worth the effort. Rather than look at going sugar-sober as some kind of deprivation, I opted to take a "wow, what's out there to eat that I've never tried before" perspective. I've not been a big fruit fan. But I must say I've discovered some pretty fabulous fruit that makes me work at eating it (dehydrated mango strips = lots of chewing; pomegranate = lots of peeling; ruby red grapefruit = even more peeling) and thus prolongs snack-time (more like snack dining than snack scarfing) and makes it much more satisfying. I also purchased 6 sessions with a personal trainer, who I carefully screened (whilst huffing and puffing my way on an eliptical machine at the 24-hour Snap Fitness gym just a few blocks away) for several weeks. See, I tried personal training once at a big gym, and I could barely walk for the next 3 days, while the trainer marched off to an hour-long spinning class, then jogged over to teach bodypump for an 90 minutes. I didn't want another crazy exercise addict putting me through any paces that would set me back from my goal of building the strength and endurance I need for safely mushing. So I set the bar quite high. Watching Uber-Awesome Trainer Alex work with a couple every Thursday morning (discreetly, out of the corner of my eye) let me scope out the suitability of a match. 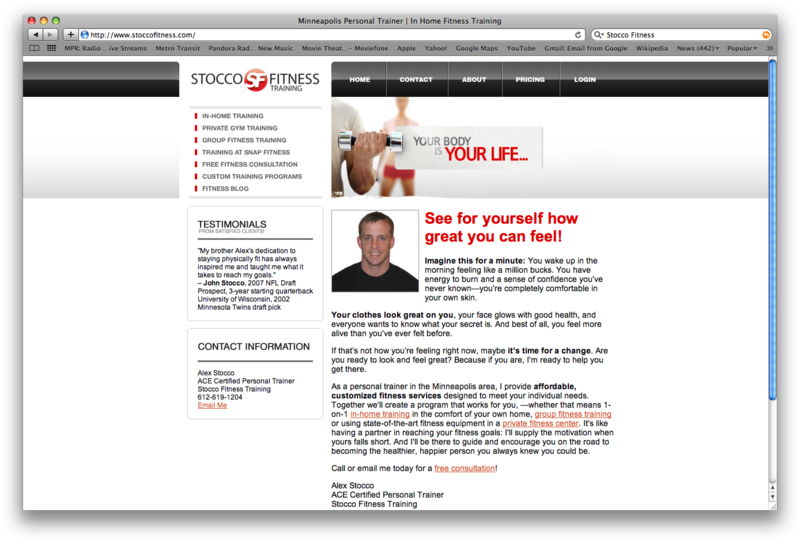 I was quite impressed with his enthusiasm, attention to his clients, and professionalism. So I sat down with him one morning, told him my limitations and my goals, and he started tailoring a plan for me on the spot. I've been hopping (yes, hopping) out of bed on Tuesday mornings as 5:40 am to meet Alex at 6 am. Come 7 am, I wobble my way back home, but by the next day, I'm just fine, and I am making honest-to-goodness progress. After sledding on Christmas day, I had zero-zippo-zilch-nada soreness or pain. And I credit Alex with helping me get sturdy enough to engage in my beloved winter sport. I've been without a car for going on 5 years, and my last car burned waste vegetable oil or biodiesel. But I decided I didn't much care for the politics around biodiesel, so I opted out of car ownership for a spell. I did use Mr. B's on weekends when I really need to run errands that could take hours by bus. Mostly it' was fine, surprisingly fine, actually. But I've yet to figure out how to board a bus with two Huskys (who are most definitely not your traditional "helper dogs") and a rather long sled to travel to a suitable trail for a morning run AND return home in time for Mr. B. to have the car by 6:30 am. Miss SubaRuby Rae, who was christened last month with SNOW! Dear Mr B. He has put up with many of my crazy notions over 30 years, but I think he'd agree none has taken hold of his "bride" quite like mushing has. (Ok, maybe beading comes close). He's a mighty fine handler, too. And he has been the voice of reason when I've expressed certain intentions related to mushing by, for example, giving me the stink eye and saying: "Are you out of your MIND?" But this week, when I broke out the the sled, he joined me, running ahead to encourage the pups, and at one point asked: "When do I get a chance to drive?" After about 20 minutes, when I suggested it was my turn again, he complained: "So soon?" I knew at that point,I had him--hook, line, and sinker! As best I can tell most of the better mushing trails are at least a 30-mile drive from my sweet little village nestled in the southwest corner of Minneapolis. But there are 3 awesome lakes and a creek that totally freeze over during the winter, all of which are in walking distance. Around each lake are separate bike and walking trails. So it hit me! I needed what's called a kick sled, which is like a chair on skis only way cooler. I did TONS of research to find one that would meet my needs and found (via Google images) the perfect little kicksled in Manitoba, Canada. It's only 10 pounds! Sometime, I'll share the story of trying to get a Canadian-made sled across the border in this day of heightened border security and reluctant shippers. But for now, I'll just say that Rob and Tammy at Prairie Dog Supply have practically moved mountains to get this pretty little kick sled 400 miles south to me. Having been roughed up a bit during shipment, my sweet kick sled arrived in need of repair. And the necessary part is on its way. Once we give it a test drive, I'll post some pictures. And I suspect (at least I hope) we'll be laughing all the way, ho, ho, ho. our little Team at the 44th Street Accidental MicroKennel! 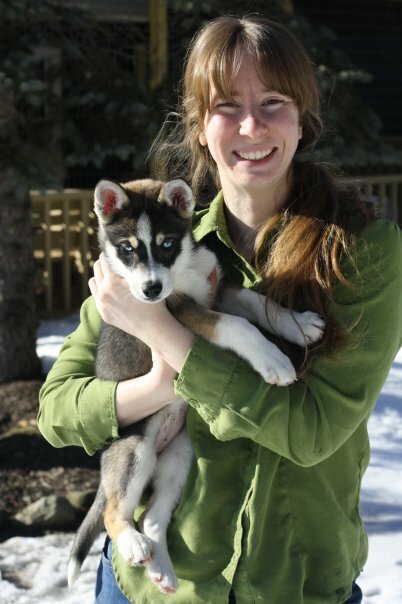 Shannon Miller of Diamond Dogs Racing Kennel in Ohio, my friend and a terrific musher of Diamond Dogs Racing Kennel who made my dream come true by allowing me to adopt Ginsberg. And Amanda Stanoszek of Hoof and Howl Farm, whose gentle and wise words got me through the hardest parts of puppyhood (ie, housebreaking) and who adopted Ginsberg's sister, Tempo, who has turned out to be a powerful little sled dog. 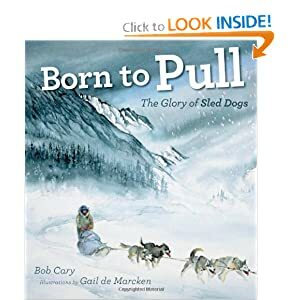 fascinating story of mushing, Kathleen. Hope you have a great season, and most of all, enjoy yourself! It looks like a fantastic sport! Well, what a great team to have around you! And hurray for SubaRuby Rae! I admire your tenacity; determinedly driving (ahem!) towards your goal. Wow! It looks like you have a fabulous team in place. You have had an incredible year with Ginsberg. I love seeing and reading about your adventures in sledding. Oh, it looks like so much fun. I think I could even endure snow for that. A smiley face post indeed. You have such a great team, you seem to be covered on all fronts. However, by the looks of that last picture, the DRs may be two of your most important team members! Happy 2011 to you and the Team! What a great update Kathleen. You seem to be having a ton of fun. And I'm so glad you're pain-free. That's huge. Happy 2011. Wonderful Post, Kathleen. It looks like you have some AMAZING people (and animals) in your life. You are blessed. I am impressed by your 5 years of car-free- ness. The Suby, though, I think is a good choice, given your dogs & mushing gear... and the fact that it is AWD. 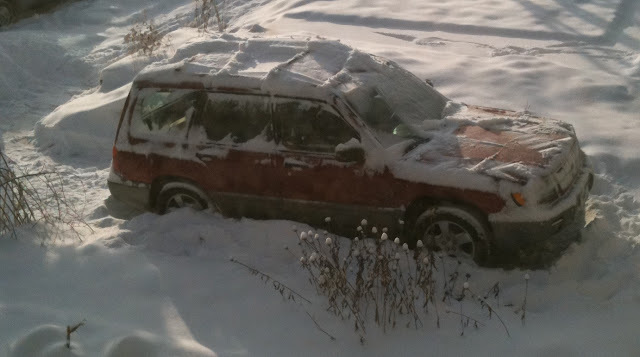 A car w/ seat warmers in the salvage yard? wow.